Brown Books Publishing Group, 9781612549408, 256pp. In this smart and witty guide to building a home while keeping your sanity, architect Kristina Leigh Wiggins shares knowledge accumulated from years of experience as a project manager, and explains how to stay organized when creating or remodeling your home. With advice on topics ranging from maintaining communication with builders, architects and your spouse throughout a project, to commute planning, Wiggins leaves nothing out. 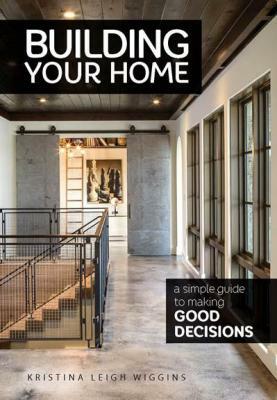 Building Your Home: A Simple Guide to Good Decisions is filled with beautiful photos of homes, gardens and materials, sketches, and detachable pages and sections to pen in responses that make the book interactive and adaptable to any level of home building. Wiggins goes beyond just a check-list of how to build a home, helping the reader create a realistic and all-encompassing plan in order to achieve what they really want in a home. From pre-planning to moving in, this guide keeps you comfortably afloat the moving, building, or remodeling process that we all go through at some point. Kristina Leigh Wiggins is a successful residential architect and designer who has been pursuing her passion since she was a teenager in shop class. She studied architecture and design at Texas A&M University and founded her own wildly popular design and consulting firm soon after. She also founded her own fashionable clothing line called lil&tess, named after her two daughters. Kristina has been passionate about helping people build and remodel homes for years, and wrote this book hoping to provide people a guide for a chapter of life that can be overwhelming but also extremely rewarding if one simply knows how to make good decisions.